Hi, friends! I mightah told y'all that we're on a bit of a Rousseau-tiger-y kick at my school these days. 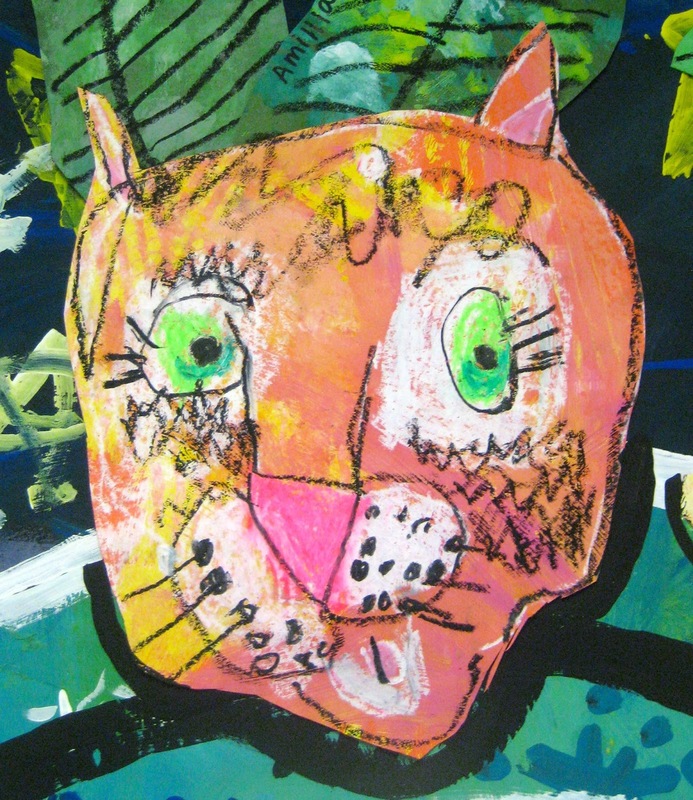 If you follow me here, I've shared tons of photos of my young artists tiger-tastic work. 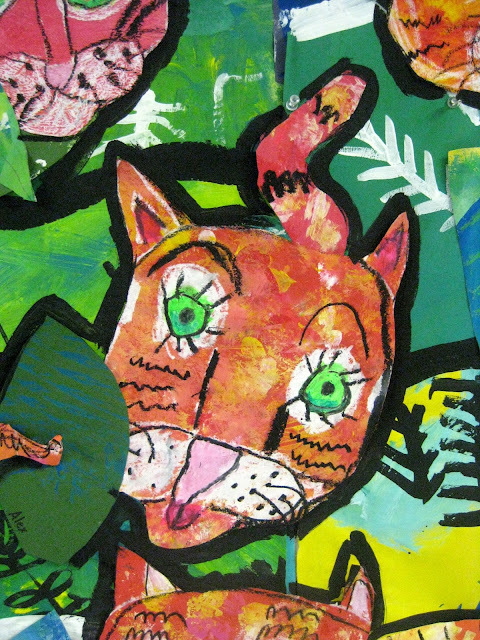 Last week I shared the relief sculpture tiger pieces created by my fourth graders. I'll be certain to share all the deets on the other projects as well but for today, I thought I'd start with y'all the biggest hit: The First Grade Henri Rousseau Jungle Mural! A lil back story: we have our school Open House after the first month of school. I try my hardest to have a work of art hung by each student for the occasion. The last couple of years, we've done Dot Day. This year, I decided to opt for a different theme: Henri Rousseau's jungle paintings. I chose this for a couple of reasons. I'm emphasizing that Art is an Adventure and that artists are too! Also, the tigers are our school mascot so it looks fab-o and school-spirit-esque to see them plastered on the walls of our school. Having an over-arching theme for all grade levels really helps me keep my learning targets in line (5 different art lessons is enough! You add 5 different themes/topics/cultures/etc. and my lil mind is blown). So, Rouseau-inspired tigers it was! And first grade totally nailed it. To start, we began the school year by painting and texturing papers. The first grade was allowed to pick from a variety of warm colored pieces of construction paper. They added white, yellow and red to these papers in any way they decided. These were used as the basis for our tiger drawings. To better explain the process, I created a video! 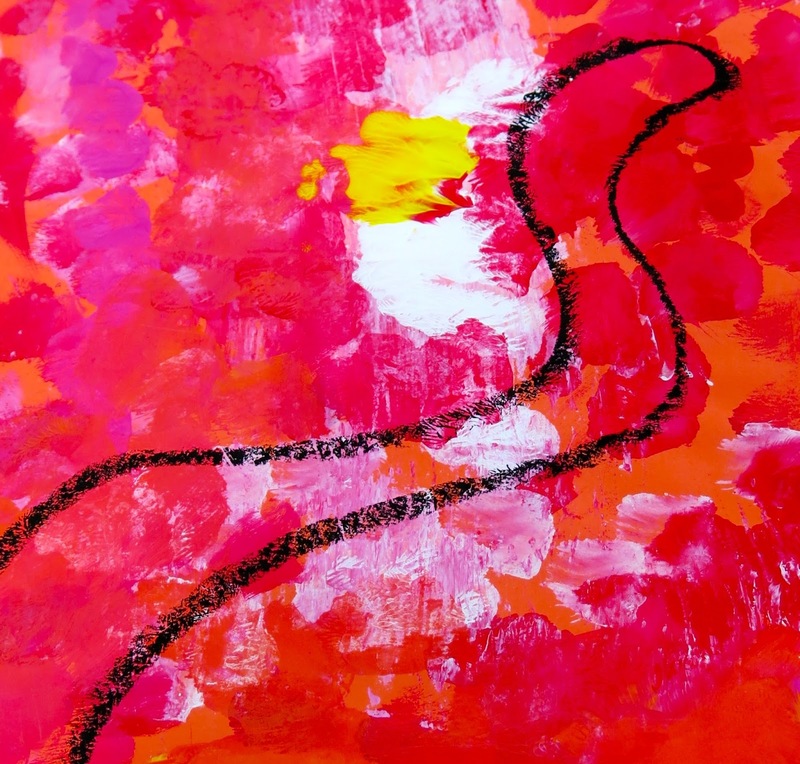 This video is in kid-friendly format so feel free to share in your art room with your students. I'd love to hear your thoughts on the video! I created this just for y'all...so please let me know what you like, what you'd like to see more of and if you'd like me to pretty please stop. By the way, sometimes my videos go up on my youtube channel before they debut here. If you subscribe to my channel, you'll be the first to view...lucky you! In case you can't stand the sound of my voice, I've got snaps of the drawing steps. I drew with the children while they sat on the floor with their papers and oil pastels in front of them. We emphasized each element of art as we drew. This was a great way to introduce the elements of art by demonstrating them in our drawings! When using oil pastels, I always emphasize that we are not to wipe the oil pastels as they'll smear. My fave oil pastel brands are Sakura but I do love Gallery's fluorescent oil pastels. That's what's used on the eyes and the nose. So bright and the viscosity is very smooth. We used black last because it can be the most disastrous as far as smearing goes. The kids were really excited to use black as suddenly their drawings came together. I love the sweet personality of each tiger! Once the drawing was done, we used our green painted papers to create leaves for our tigers. These were added either in front or behind our tigers. From there, we added a tail and glued that to the back of our tigers. We used some scrap paper to create the tails. For the tail, we talked about line and the kids drew any kind of line they wanted. Then they created a parallel line to follow the first. Then zigzag stripes were added. Once the tigers were complete, the mural was ready to be created. We spent one 30 minute class painting huge sheets of bulletin board paper green. The kids loved it! They called it a Painting Party and attacked those large sheets of paper with a ton of energy. The following class, we dialed it way down and talked about pattern. I started an organic leafy design on each paper that was green and a star pattern on each paper that was blue. The kids were given small brushes and asked to create a pattern of the original design. The next morning, I got to school about an hour before it started, got super jacked up on coffee and busted that mural out. I laid 12' sheets of paper on the floor, one for each class. I started by gluing down the night sky papers with my high temp glue gun. Then the land papers were added. To finish, I went over each land form in either black or white paint. HOWEVER, once the tigers were added, they completely vanished into the busy background! I was so sad! So I decided to outline each of the tigers in black paint. Again, this took no time because I had injected coffee straight into my eyeballs. Turns out you can run laps around the universe if you do that, who knew?! And, viola! By the way, here's a peak at our Jungle Lounge and here's a look at the mural that this one replaced. Thanks for dropping by, y'all! Hi Brenda! I guess I shoulda mentioned that in the post! There is a cork strip that runs horizontally right thru the middle of that mural. I did add pins there to each panel (I hung each one at a time) thru the middle and then used high temp hot glue to attach it to the wall. Once it was up, I then added the tigers. Does that make sense? Lemme know if you have more questions! xo! I love your blog and this mural! So your principal lets you glue things to the wall? 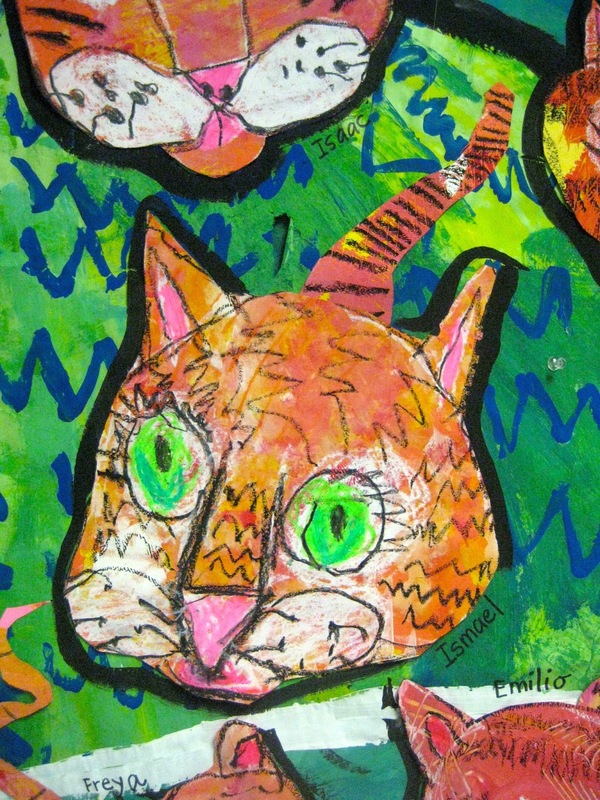 I Adore this tiger mural - Everything I Love about children's art! Love this project! Question, how do you give the children back their tiger at the end? Do you cut up the mural or pop their tiger off of it? Hi Lynn! Glad you found my blog and have enjoyed reading! I hope your first grade loved it!! xox! Our school mascot is a hawk. We are in the pineland of NJ. Wondering if I could modify this for the school-spirit tie-in? Yes!! That's what we did since we are the tigers! You could do a mural inspired by Audubon and create a mural of hawks!! How amazing would that be?! I enjoyed the tour of your art room! I was wondering where you store on-going art projects? Do you have your students make portfolios or do they take work home as it is finished? Oh Cassie this is just so amazing. I've been thinking about this project since I've been on maternity leave so now I'm diving in with my 2nd graders. LOVE IT! This will be perfect! Our school is doing a Celebration of the World, each class picked a country that class is then going to decorate and put up a display about that country.The school is going to take a tour of each country and learn about each country. I have a first grade class doing Brazil. They will love this project and it will look great hanging in the classroom. Thanks! I've done this with my second grade for two years in a row and it's a hit every time. The kids are so proud of their work! I'm also introducing first grade to Ed Emberley (whose work reminds me a lot of this!!). Do you know his stuff? Winner-Winner Chicken Dinner! The Results are In! DIY: A (Brush)Stroke of Genius Dress! In the Art Room: Sketchbooks for Kids! DIY: A Color Wheel Clock!